Isolated Systems Ltd (ISL) is a qualified supplier to many of the world’s leading OEM turbine manufacturers and gas turbine ‘package’ manufacturers. 1) Compensate for the expansion and contraction of the steel exhaust system during normal and cyclic turbine operation. 2) Isolate vibrations from the turbine to its exhaust system. 3) Minimise loads transmitted to the turbine outlet flange. Our range of expansion joints, (or compensators), are ‘AO’ rated as standard meaning integrity will be maintained for a period of sixty minutes in a cellulosic fire scenario. Due to the very high temperature and extreme buffeting associated with gas turbine exhaust applications, stainless steel wire mesh is included within the construction. The mesh provides additional mechanical strength, and protection from the high velocity, turbulent gasses as well as maintaining the bulbous shape which further promotes expansion compensation. In addition to our ‘standard construction,’ compensators can be designed to accept over-clad insulation for the purposes of heat recovery or personnel protection. At design stage, we would evaluate and ensure compatibility of all components with respect to the interface of the gas turbine outlet flange and exhaust system flange. Consideration to their respective materials of construction and assessment of the supporting steel frame – this ensures an optimised solution. Metallic expansion compensators are installed within duct systems in order to compensate for changes in length due to temperature fluctuations. In addition, vibration isolation from rotating equipment such as pumps, motors, compressors or turbines and compensation for pressure pulsations within piping systems. 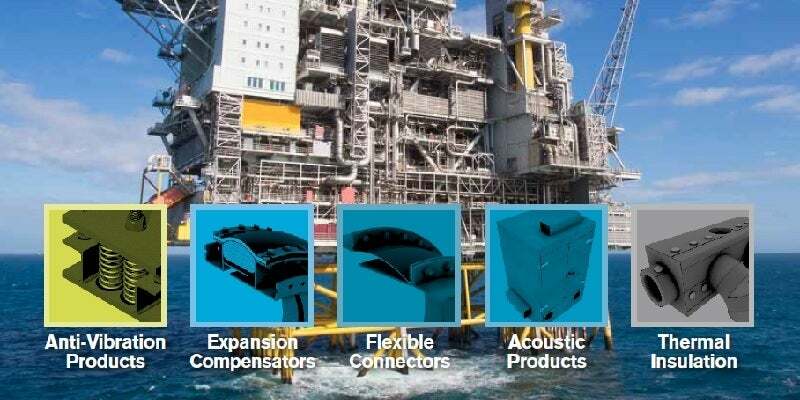 Rubberised expansion compensators are typically used to compensate for large extensions in axial, lateral or angular moments and to isolate noise and vibration associated with cooling water pipework, pumps, turbines and boilers within power stations. Through careful material selection, they are particularly suited for use with aggressive media such as wet chemical service and flue gas desulpherisation plants, (FGD). In such applications, condensation of the gas media creates highly acidic liquor which is not compatible with our fabric expansion compensators. In addition to the performance listed above, these items can also compensate for misalignment, seismic and wind loading induced movements. Our joints are manufactured from a single elastomeric layer of material having laminated reinforcing layers. ISL’s range of thermal insulation jackets provide a pre-shaped high temperature flexible wrap-around cover, constructed from the highest quality heat resistant materials to suit the specific application required. Thermal insulation jackets are fitted to turbine structures including the turbine body, diffuser, exhaust system, process pipework, valve bodies etc. and can also be used for diesel generator / engine exhaust manifolds and pipework for industrial and offshore industries. Typical construction consists of an inner knitted stainless steel mesh and high temperature glass cloth with body soluble ceramic and glass needle matt insulation material. An outer grey silicone coated glass cloth sewn in stainless steel thread helps to repel fluid contamination. Fixings include straps with ‘D’ rings and steel lacing hooks. Calcium Silicate Insulation is commonly used as a safe alternative to Asbestos for high temperature insulation applications up to 1,000 Deg.C with the added benefit of reducing noise breakout. ISL’s high temperature pipe insulation is supplied as pre-formed ‘shells’ designed to close around pipework straights, elbows, flanges and valves. Available in a wide range of standard pipe sizes from ½” to 24″. In the example of a routine ‘outage’ onboard an offshore platform, typically our engineers will make an initial visit in order to undertake a site survey. Detailed measurements and drawings are produced from which our quotation for the manufacture, supply and install is submitted. These operations take place in the months prior to the scheduled outage. In addition to scheduled maintenance, both our factory production and site services team can respond very quickly to breakdown situations. Such is our flexibility and resource, we have previously manufactured a replacement joint within two days, (over a weekend period), and delivered the finished item to Aberdeen shore by the Monday evening. Isolated Systems specialises in the design, manufacture and installation of industrial noise, vibration and thermal management products.